On January 20, a Docomo employee told us (among other things) that the Android-powered Xperia is coming in March. Turns out it is coming, but in April, according to a January 21 press release. NTT DOCOMO, INC. today unveiled its docomo Smartphone Xperia™, manufactured by Sony Ericsson Mobile Communications and known as the Xperia™ X10 in markets outside Japan, which is scheduled to go on sale in Japan this April. The press release touts several features, including what sounds to be a much improved IME, as well as several other features, such as "Timescape" contact organization and facial recognition. Detailed specifications are listed here (pdf). It will have 1 GB of ROM, which is significantly more than the current HTC Android phones, but much less than the iPhone, support a 16 GB microSDHC card, and have a proper 3.5 mm audio jack. The OS is currently listed as being Android 1.6 "Donut," but I believe it will ship with 2.0. At least that is what I have been told. In fact, the PDF indicates that the specification are subject to change. It also sounds like Docomo is getting serious about smart phone users. Thanks to reader chyro for providing the link to the press release. Nice blog. Keep it up. 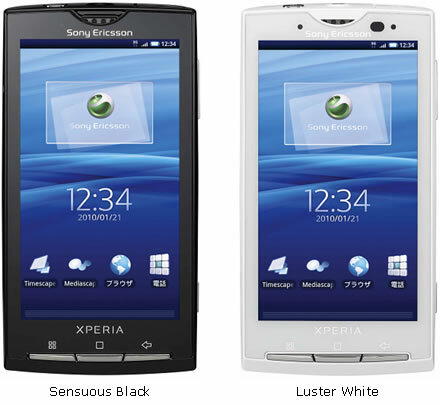 Very excticed about the new Xperia coming to Docomo, and hopefully getting Android 2.0.